PIDflight - Developing fresh DIY projects for FPV enthusiasts! PIDflight is a simple app that allows you to adjust your PIDs on the fly for Cleanflight, Betaflight, ButterFlight, KISS and RaceFlight One firmware! PIDflight VTx is a simple app to adjust your TrampHV or TBS Unify Pro video transmitter settings such as band, channel, power and pit mode. 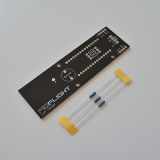 PIDflight Lap PCB is perfect as a single lap timer or connect many together for a multi-pilot lap timer. Shipping limited to Australian residents only, please inquire if you are outside of Australia.